There’s no rose that’s any yellower and no foliage that’s any greener. The combo makes your eyes blink & your head spin in disbelief. Better yet, the flowers hold on to their searing yellow tones to the very end, dropping away from the well-behaved plant just in time to welcome the next round of bloom. Tidy enough to tuck into a landscape, lend an accent to a container or top a rose tree. Loads of bright, super-glossy apple green leaves mirror the blazing blossoms. Yellow. Flowers deep, intense, bright yellow, fading very little. None to mild fragrance. Average diameter 2.75″. 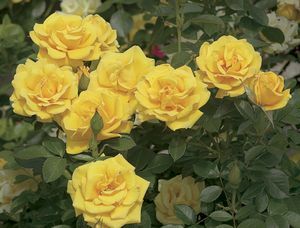 Medium, full (26-40 petals), cluster-flowered, in small clusters bloom form. Blooms in flushes throughout the season. Medium, compact, rounded. Medium, glossy, light green foliage.